Is this possible to do? I've tried searching on the SPClientForms object and in particular SPClientForms.ClientValidation and SPClientForms.ClientFormManager but I can't find out if I can trigger it. Assume the scenario where we need to add client side validation for Email column in the Contacts list. PreSaveAction function from another hand, allows to override behavior for a Save button. In both the New form and the Edit form the Save button has onclick which triggers PreSaveItem() which is a function in FORMS.js that invokes a function called PreSaveAction which is a user defined function, meaning it is a function you define and decide what should do. 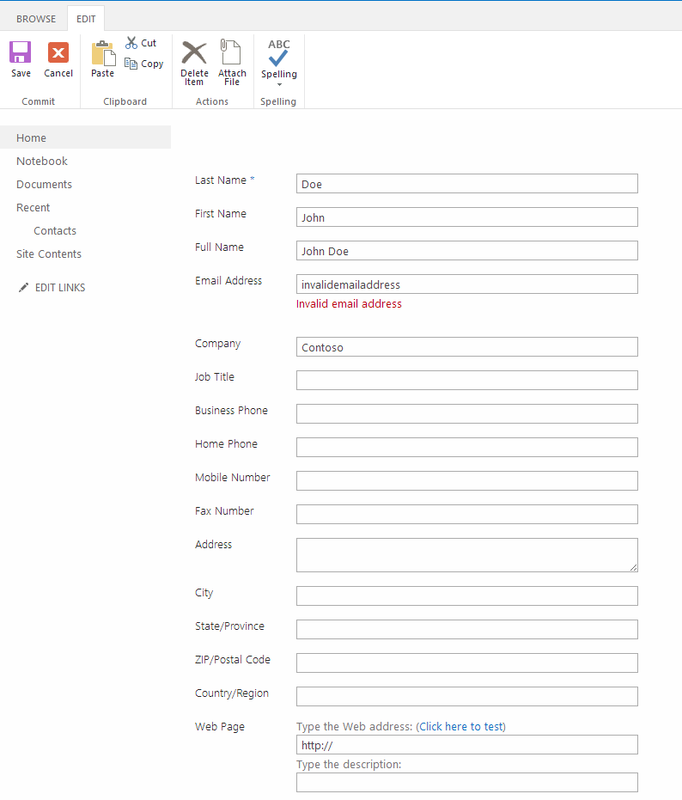 Preferably placed inside the New/Edit form directly to perform validation in the specific form. It's manual, yes, but at least you don't need to bind a click event to a button. It's already there, all you have to do is supply the logic. If you are using SharePoint 2013 with new standard rendering (CSR) call the following method to trigger default validation: SPClientForms.ClientFormManager.SubmitClientForm('WPQ2'). I'm not sure if the WPQ2 is constant. Such suffix is added to the many elements in DOM, so it won't be hard to check. For example: id="MSOZoneCell_WebPartWPQ2". So when value is changing function UpdateAndValidateControlValue(fldName, eventArg, false); is called, but no validation message is displayed. But when the form is submiting, this function is called with true parameter and valiadation messages is displayed. I wasn't able to inject this script to change this weird behaviour. But if you have access to clientforms.js in file system, you can easily change it. To change all SP behaviour you can simply change false to true in function NotifyControlEvent. But I would recomend you to use some input parameter, so you can specify which field will have onchanged validation. I Hope it will help and lead to simpler solution.